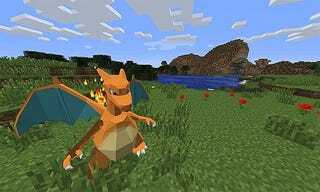 To think, in 2013 we’d get excited about people building Pokemon maps in Minecraft. In 2015, it takes a lot more than that: it takes recreating Pokemon systems in the game, from Pokeballs to the little (and big) pocket monsters themselves. Pixelmon has been around for years, but we’ve never written about it, so it’s time to fix that. It’s an attempt by fans to bring as much Pokemon to Minecraft as the latter’s code will allow. Which, Minecraft being Minecraft, is a lot. You can choose a Pokemon, summon them then give them commands. Pretty cool! In terms of how it all works, the animals of the game have been replaced with wild Pokemon, which you can walk up to and capture. You can then use them in fights against other Pokemon trainers; they’ll appear in the game world and go at it until one of them faints (as you can see below). Just like regular Pokemon! Only on your PC, and in full 3D. You can download Pixelmon here, while there’s a good starting guide here.